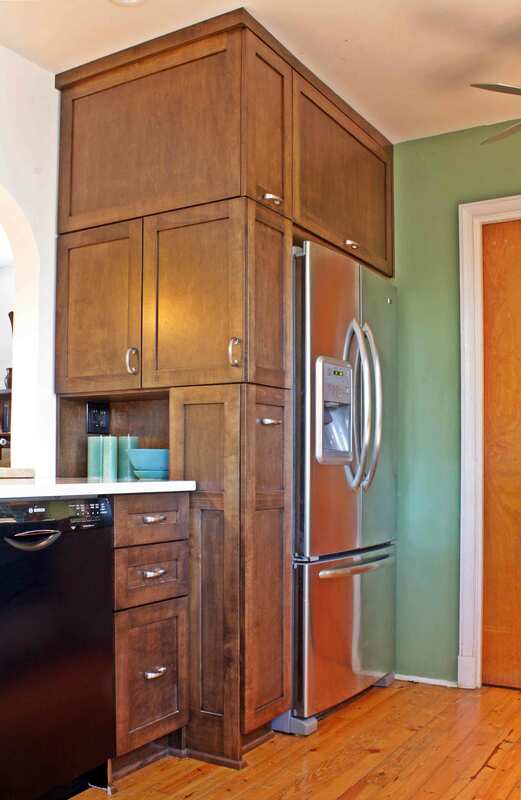 This rancher kitchen renovation resides on Richmond’s Southside in Chesterfield County, in a community of 1960’s-built ranch houses. 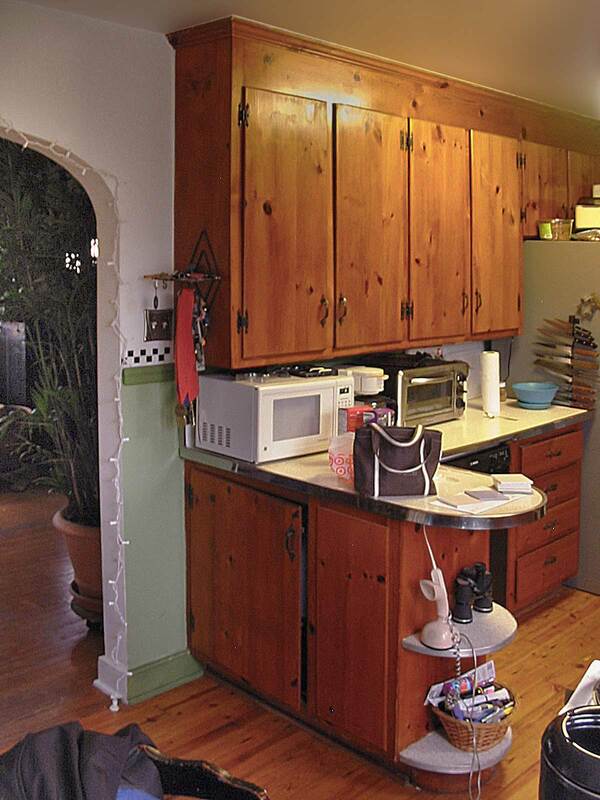 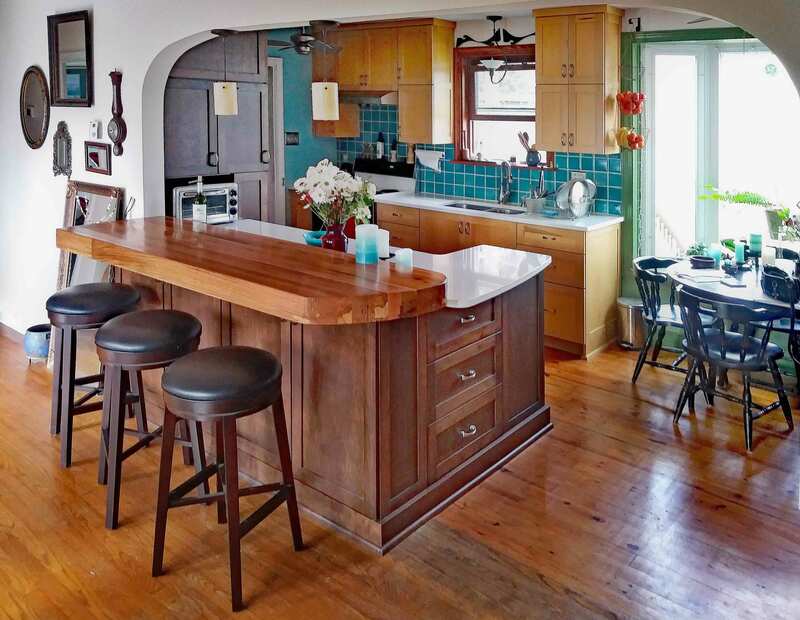 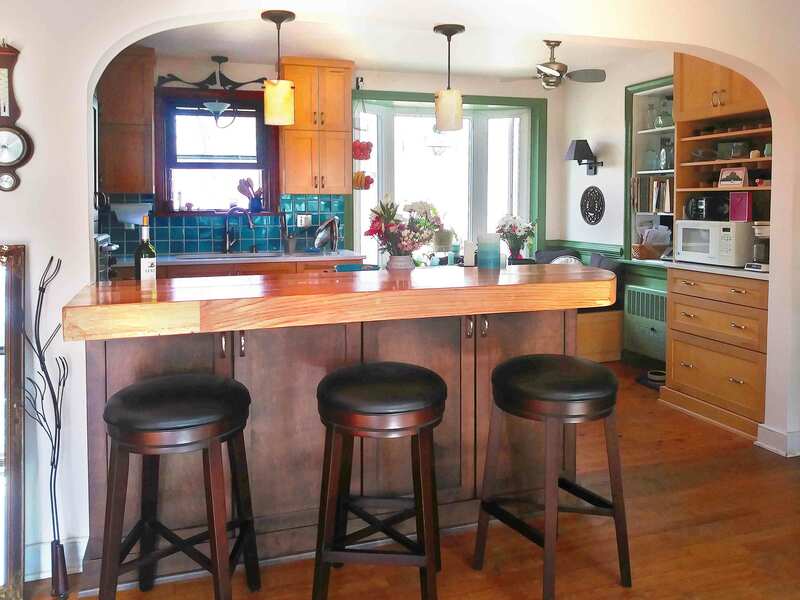 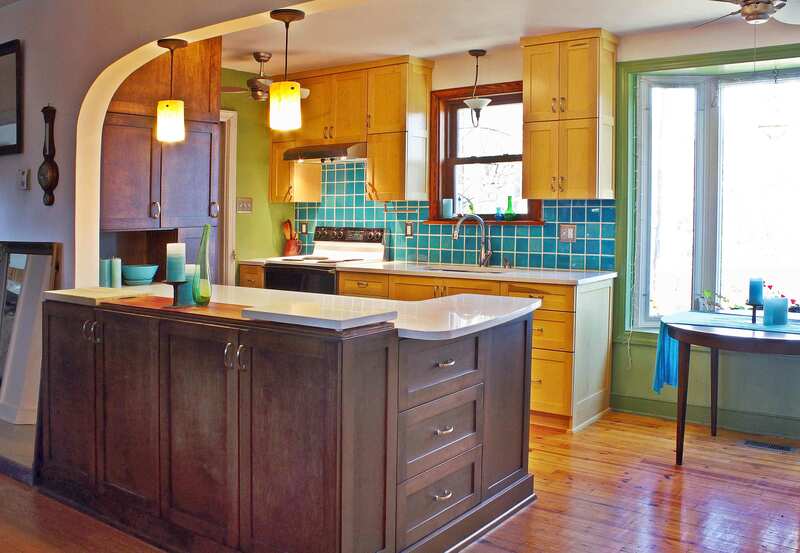 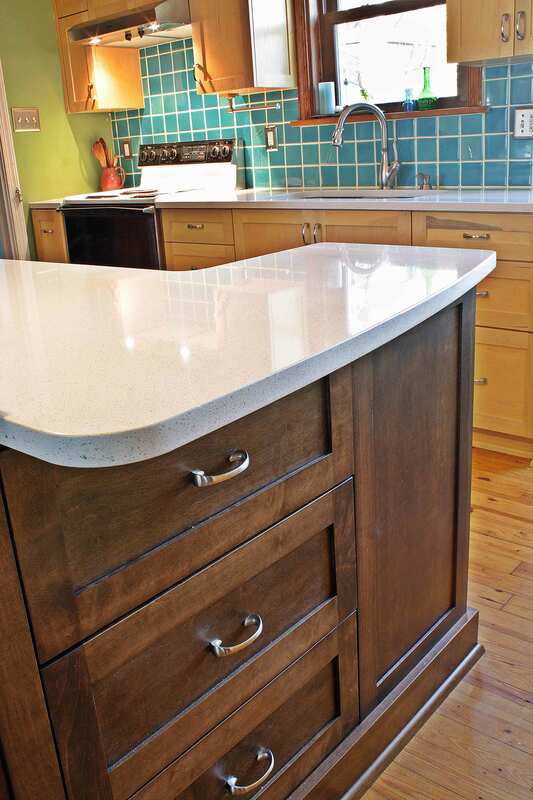 With the original framed-in-place kitchen cabinetry, a tired countertop, and the need for more storage, the kitchen was renovated and the wall between the kitchen and living room was removed for more natural light and better flow. 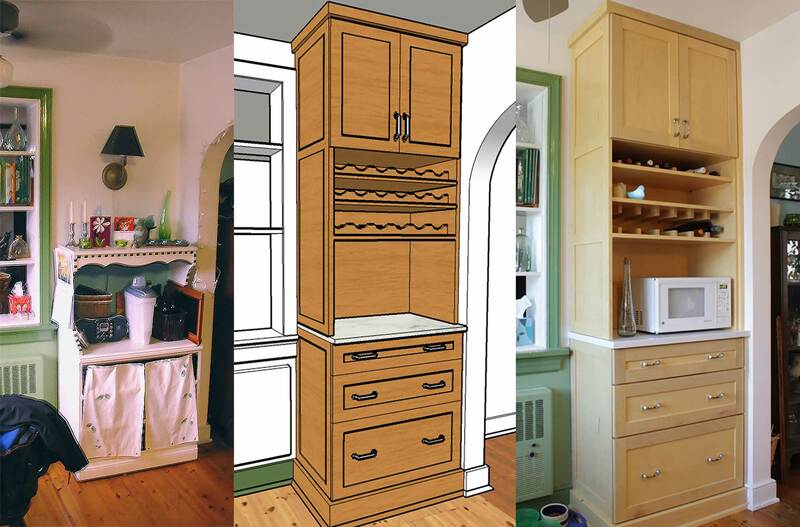 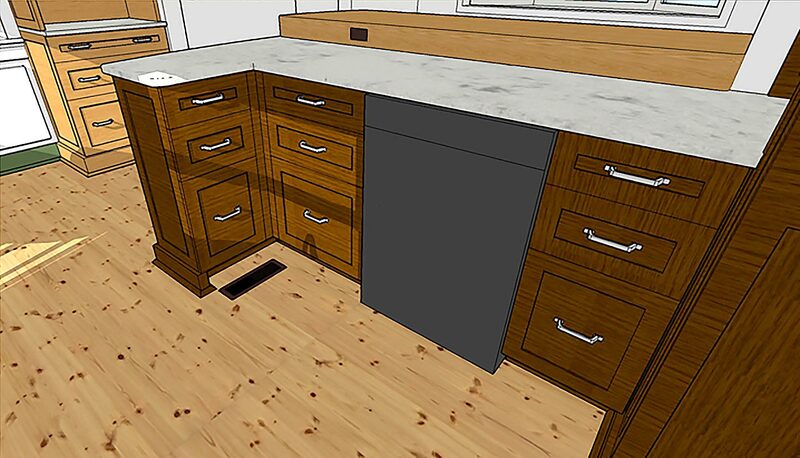 Extending the base cabinets, a new floor-to-ceiling storage cabinet with a section of quartz countertop and a new storage bench provides more storage in the small plan. 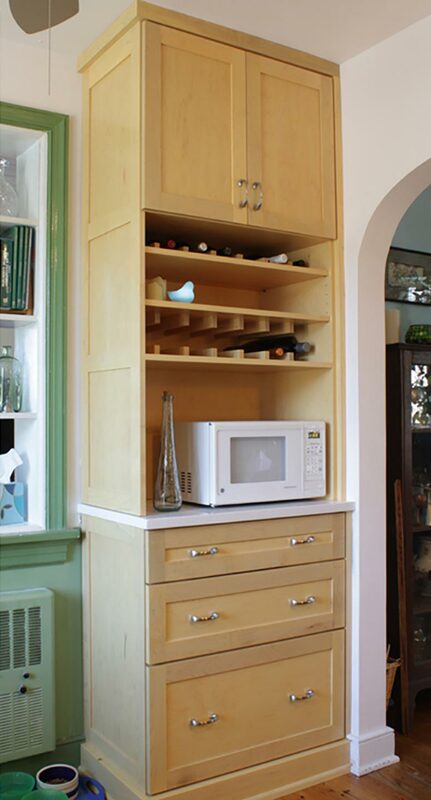 Integrated knife storage in a pull-out drawer hides the knives and above side-opening cabinets house drinkware close to the refrigerator. 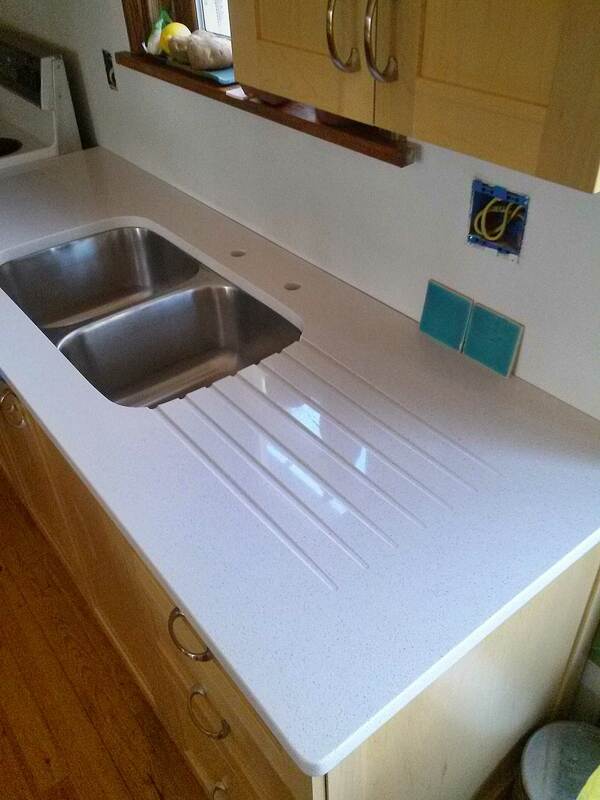 Although the design includes a dishwasher, a section of the countertop was routed for drainage for washed items between dish washer usages. 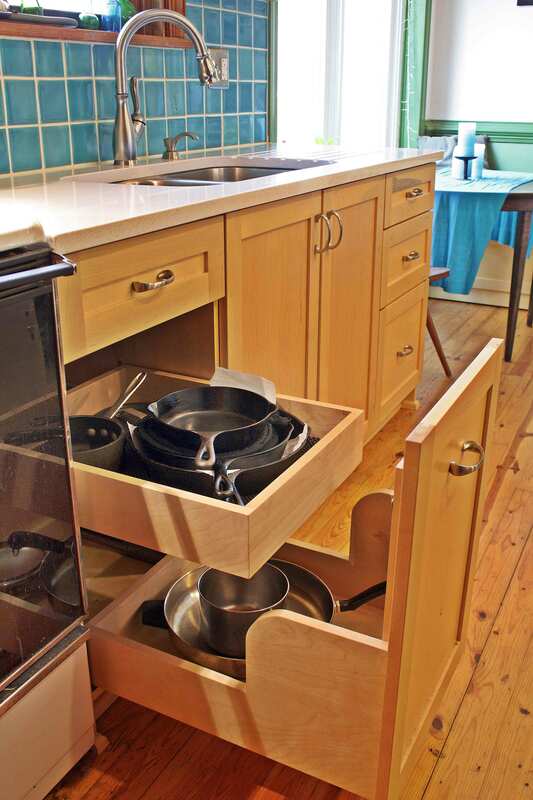 An innovative cookware pullout storage cabinet drawer next to the stove features a second upper drawer that slides independently of the main drawer for easy access to pots and pans stored on the main bottom level of the pullout. 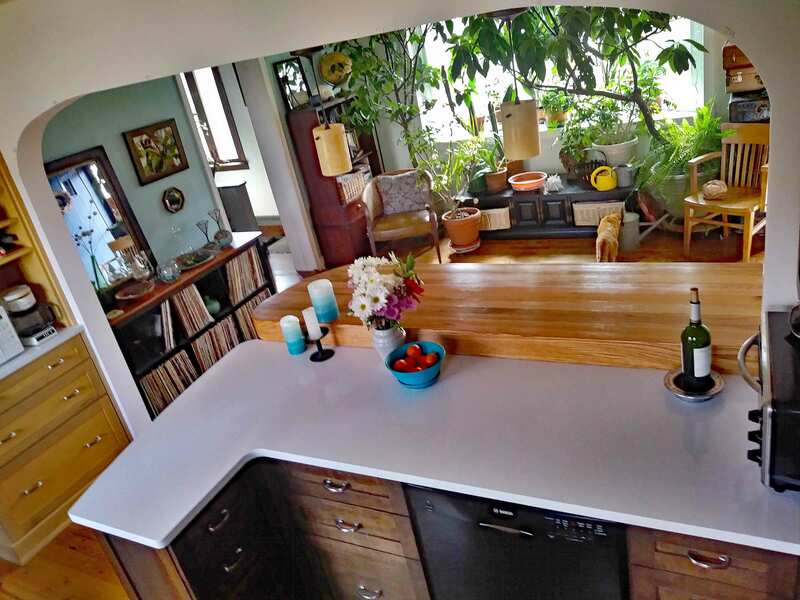 A new stainless steel sink and faucet update the space along with a reclaimed red oak bartop harvested and built on-site by the husband. 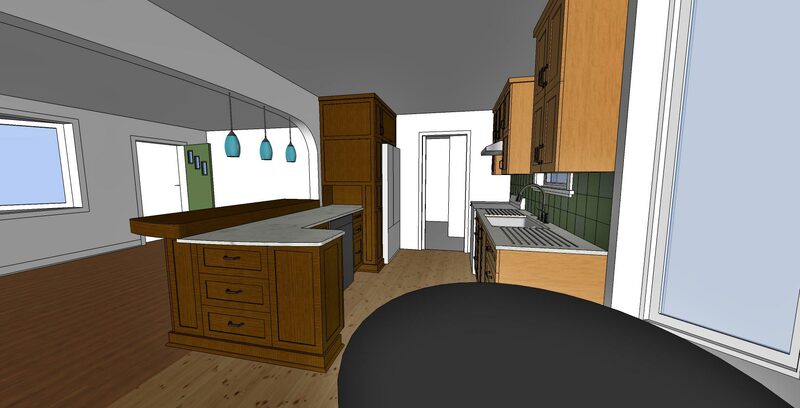 The new archway and dark cabinets transition the kitchen into the living room and the view into the wooded backyard is emphasized. 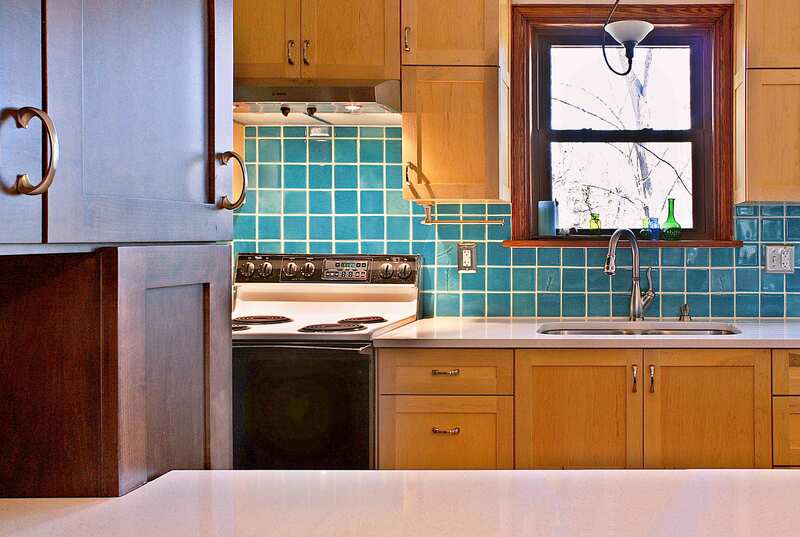 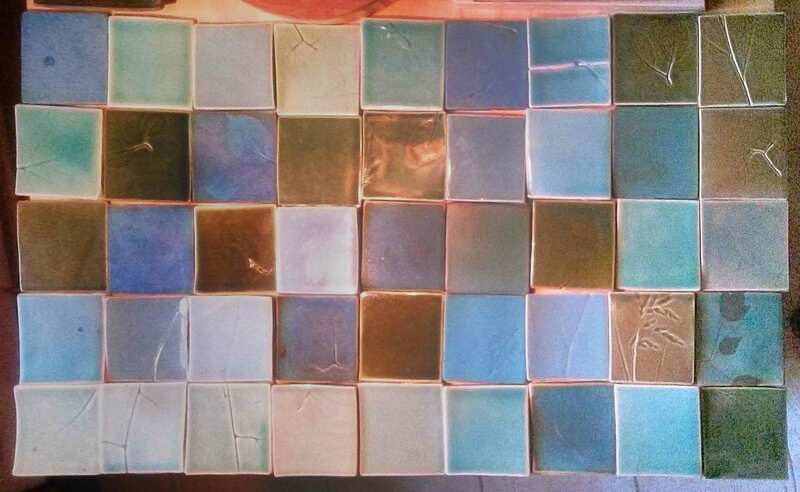 Handmade backspash tiles in a custom-mixed turquoise glaze contrast the natural blonde maple cabinets and brighten the otherwise dark outside wall. 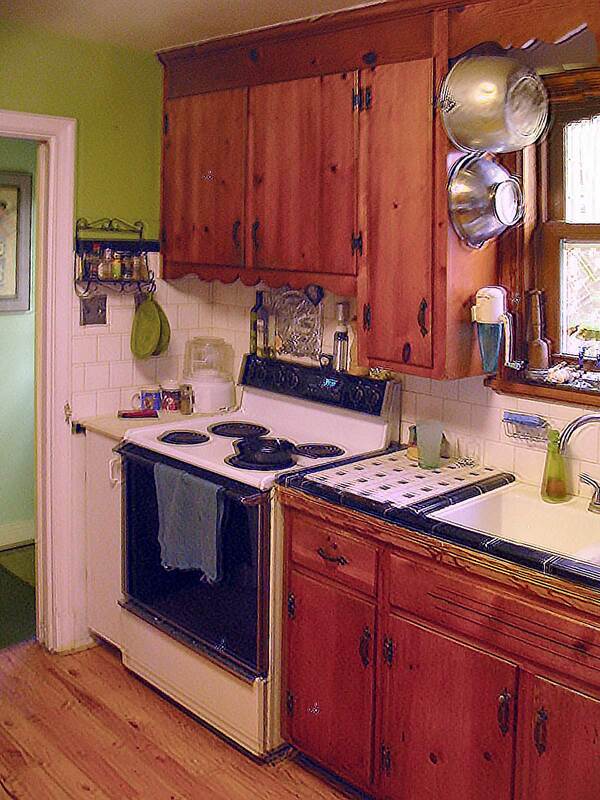 A new refrigerator was installed though the electric range remains and will eventually be replaced. 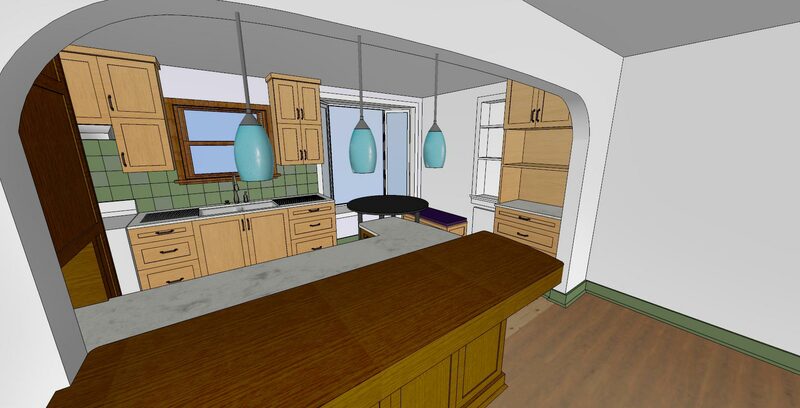 Modular pendant lighting above the bartop can have their shades changed easily depending on season or mood. 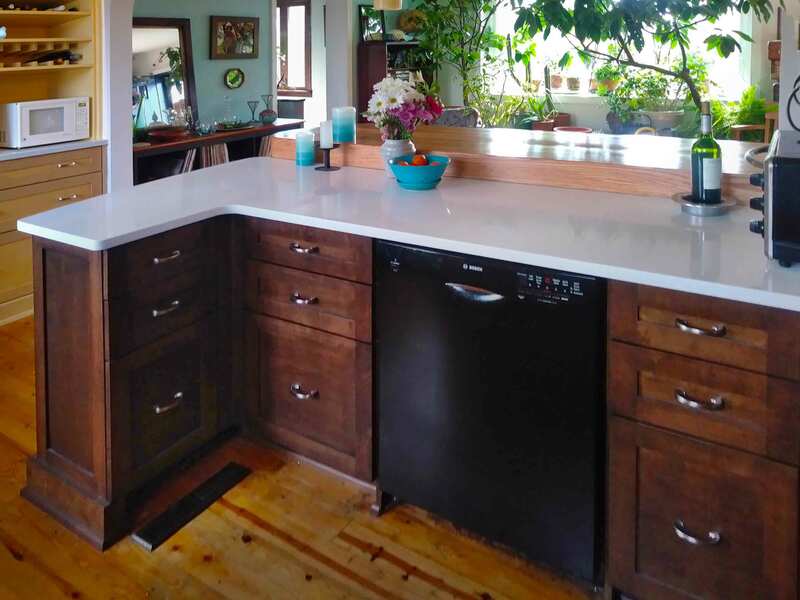 Plain quartz countertops complete the update while the wood tones add warmth and visual interest. 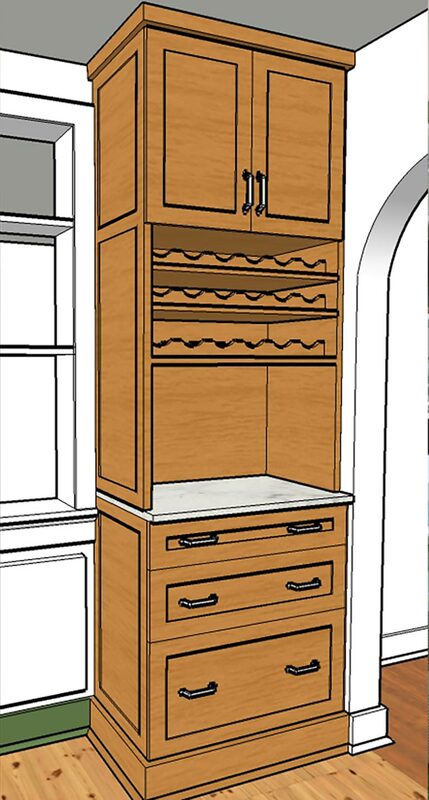 Increased jamb depth for the new archway allows a deep built-in wine cabinet offering more storage than the previous furniture hutch. 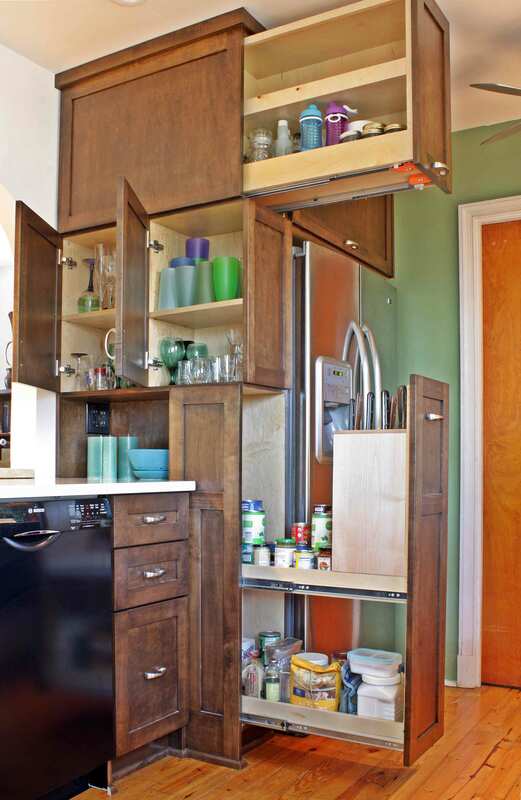 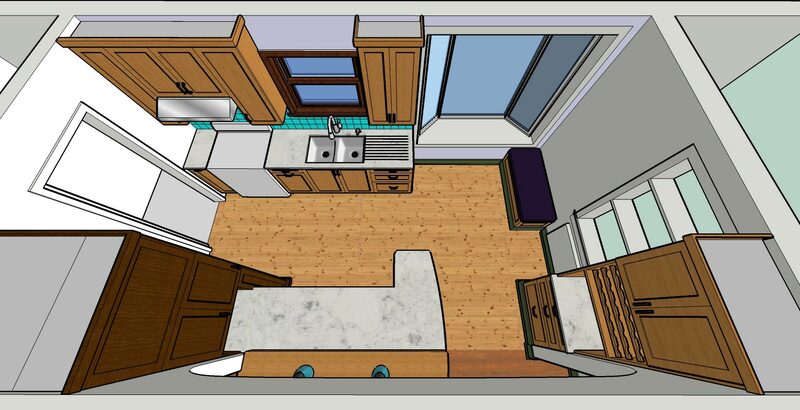 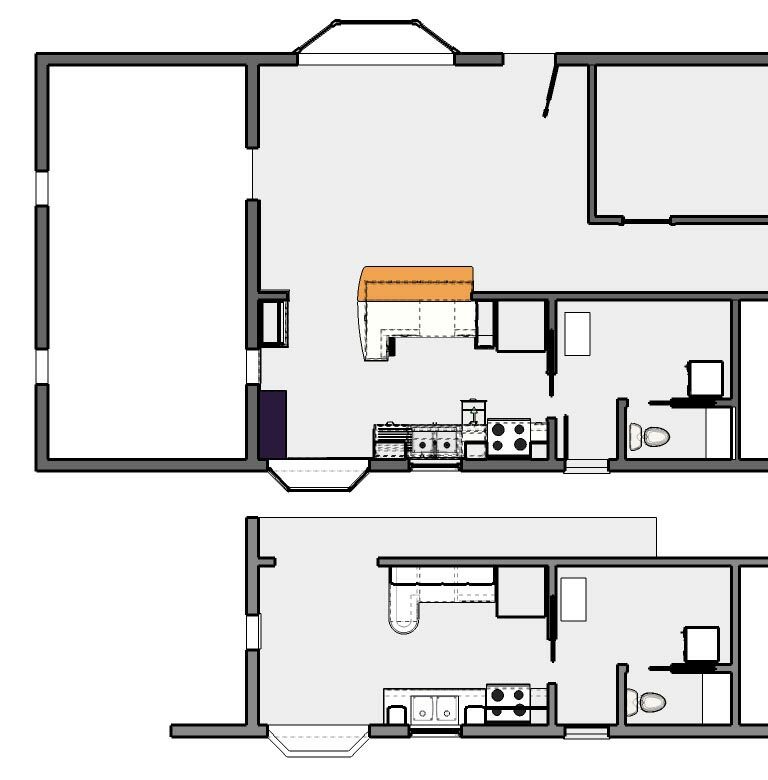 Full-extension drawer slides, adjustable wine shelves and a space for the microwave expand the kitchen.